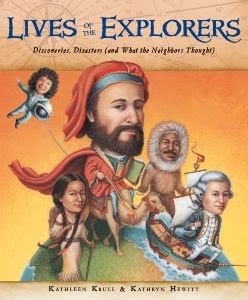 With Columbus Day right around the corner - at least around the flip of the calendar page - now seems a good time to talk about explorers. And Kathleen Krull does a pretty good job. "Exploring the unknown: it's what humans do. Since the beginning of time, we have wanted to know what else might be out there." And then she delves into the stories of people searching for "what else might be out there": Leif Ericson, Marco Polo, Zheng He, James Cook, Lewis & Clark, Isabella Bird, Sally Ride, and more. From the well-known to the not-as-well-known, Krull tells about explorers' lives, where they traveled, their deed both good and bad. Marco Polo, for example, tended to exaggerate his journeys and Columbus.... his encounters with the New World natives nearly wiped out their populations. There are plenty of maps for the geographically-minded, with routes color-coded for different voyages. And each chapter ends with an "Onward" section full of interesting facts, towns named after the explorers, myths and more. At the back there's a list of books for further reading. There is no index, but the table of contents fills that need fairly well since this is, after all, a collection of short biographies. Today is Nonfiction Monday. Hop over to the Nonfiction Monday blog where you'll find more book reviews. Review copy provided by publisher. Chicken is thrilled when somebody moves into the house next door. Now he can have a friend! "Deep in the woods, there are two houses. Chicken lives in the house with the red roof. No one lives in the house with the blue roof." Until.. one morning Chicken notices that someone is moving into the house with the blue roof. Chicken is happy - now he can have a friend. He waits and looks and peeks and wanders around outside, but no one comes out of the house. So chicken leaves a note on his neighbor's door. When Owl goes out for the night, he sees the note. It's an invitation to come over.Tomorrow! How exciting - a party. 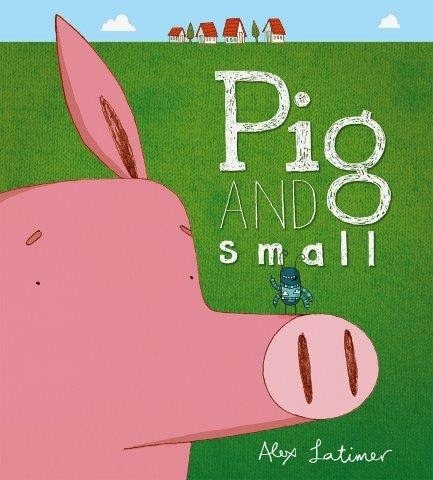 What I like about this book: Like Pig and small (which I reviewed last week) this is a story about two very different animals who work out a way to be friends - even though one is a night owl and the other rises with the sun. 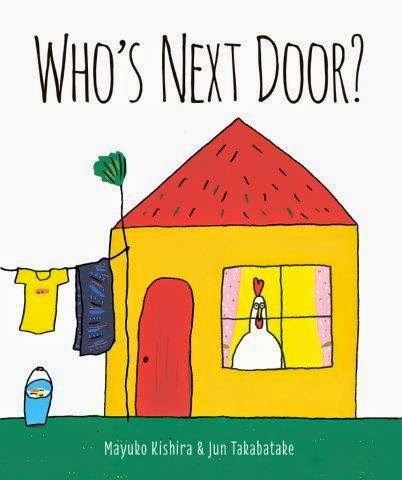 Beyond the book: Who lives next door to you? Do they leave clues about what they do? Do you ever see them? Are there any neighbors that you haven't met yet? If so, what could you do to get to meet them? Who are your nighttime neighbors? Go out on a night walk and get to meet the night owls in your neighborhood. They might be cats, or moths, or even a screech owl. My night neighbors include foxes, raccoons, Luna moths, barn owls, and lots of gray tree frogs who fill the night with sound. Today's review is also part of PPBF (perfect picture book Friday), an event in which bloggers share great picture books at Susanna Leonard Hill's site. She keeps an ever-growing list of Perfect Picture Books. Review copy provided by publisher. 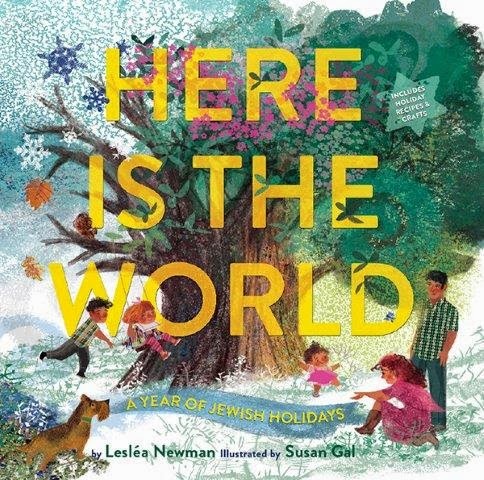 Beginning with the naming ceremony and weekly observance of Shabbat, this book celebrates a year of Jewish Holidays. And published just in time for the beginning of a new year - Rosh Hashana begins Wednesday evening. "Here are some clouds and a cool autumn breeze. Here are the leaves, falling down from the trees. Here is the shofar, its sound pure and sweet. Here are some apples and honey to eat." As the seasons turn, the soft, warm illustrations invite us to join in the family's celebrations: Sukkot, Chanukah, Purim, Passover . There is something for everyone in this book, whether you are celebrating the holidays or seeking information for a school report. There's a great section at the back that includes notes on the holidays and crafts and recipes for each ceremony: noodle kugel for Yom Kippur, latkes (of course! ), a noisemaker for the Purim parade and - for those of you who are still looking for the perfect way to welcome the new year, potato-print cards for Rosh Hashana. Pig and Small ~ Blog Tour & Book Giveaway! "Before this morning, Pig's nose had never squeaked - not even once." When Pig's nose keeps squeaking, Pig tries looking up causes in his medical book - to no avail. Finally he notices a small bug on the end of his nose. It's waving. It wants to be a friend! But what can a very large pig and a very small bug do together? Playing catch doesn't work well, because when the ball lands on bug... well... you know what will happen. And hide and seek? Then there's the whole issue of trying to appreciate gifts made by your new friend: a sweater hand-knit by bug just won't fit! Beyond the book: There are other stories about friendships between big and small - The Indian in the Cupboard comes to mind, and Stuart Little. Can you think of more? What kinds of activities can two people of different sizes enjoy together? Think of at least five, and then go ask someone to join you in one of them. If you're a little person, ask someone bigger. If you're a big dog, invite a mouse. Book Giveaway: Today's post is the last in a week-long blog tour. It's also a chance for you to win a copy of Pig and small. All you have to do is leave a comment and then email me at sueheaven [at] gmail [dot] com. Unfortunately, the book giveaway is only open to US residents. Congratulations to our last book giveaway winner: "Rhythm". He (and his human companion) help children read books in schools and libraries. Rhythm won a copy of Be a Changemaker to share with "his kids". When I was growing up, Golda Meir was the Prime Minister of Israel. I remember thinking: if a woman can lead Israel, why can't we have a woman president? So I was excited to get my hands on a review copy of this new book about "Goldie". 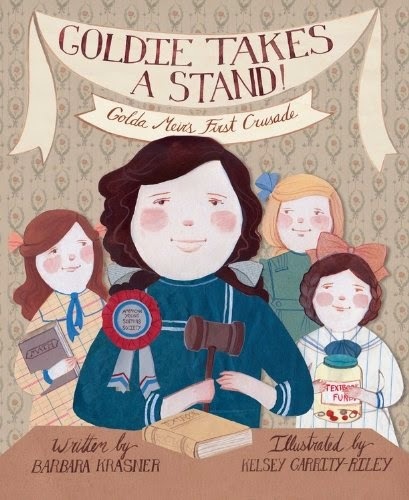 Author Barbara Krasner writes about an event that happened when Golda was in the fourth grade.The year was 1908 - and Golda's family had just emigrated to the US a couple years earlier. Golda and her friend, Regina, formed the "American Young Sisters Society" in order to raise money to buy textbooks for students who couldn't afford them. Golda tries a couple of things - neither of which works - and then decides she needs a public meeting, and ends up speaking in a large rented hall. While the events Krasner writes about are factual, she adds dialog, telling the story from Golda's point of view. She includes biographical information and a list of places to visit at the back, as well as resources for people who want to learn more about Golda Meir. Morning is Ziggy's favorite time to think up new ideas. He invented a Ziggyball - square, so it won't roll into the street. He invented stilts for his teacher - because the Rebbe is so short. But... they didn't work out so well. 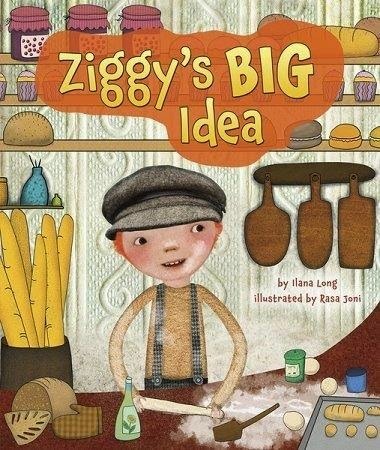 Then one morning Ziggy comes up with an idea for the baker. See, the baker makes wonderful buns, but sometimes they're not quite done in the middle. And Ziggy thinks he's got the solution: get rid of the center. OK - so maybe this isn't exactly how the bagel came to be, but this is such a fun story, wonderfully illustrated, complete with a bagel recipe at the back an a cool fact about bagels in space. If you've seen other flavors, leave a comment and I'll add them to the list. Be A Changemaker ~ Blog Tour! Author Interview! Book Giveaway! We’ve all done it: thought, “someone should do something about (fill in the blank)”. But here’s the secret: if you want something to change, you might have to be the changemaker. The cool thing: you don’t have to be a president or congressman to be a changemaker. You don’t even have to be “old”. In Be a Changemaker, Laurie Thompson profiles young people who saw a need and took action. One 12-year old boy, appalled at how children were forced into labor in slave-like conditions, founded a group that became Free the Children. Another kid formed a club at his school that he called Earth Savers, which grew and evolved into Greening Forward, a group that helps kids develop their own Earth Savers clubs. Thompson writes about kids who’ve created gang-free community centers, raised money to feed the homeless, developed an acting company focused on preventing accidents, and more. In each chapter she also focuses on specific skills needed to bring about change. Want to know how to conduct interviews and surveys? Check out the chapter on researching your ideas. Need advice on how to raise money through donations and grants? Thompson’s got a chapter on that, too. 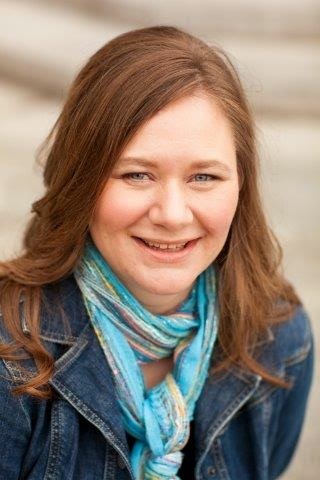 She also includes personal reflections about everything from raising money selling Girl Scout cookies to taking the plunge to become a writer. As if that’s not enough, I asked her Three Questions – which she most graciously answered. Sally: Why did you want to write this book? Laurie: When I was a child, I desperately wanted to do something important that would make the world a better place. Unfortunately, I had no idea how to do something like that… or any inkling that I even could! I couldn’t wait to grow up so I could go out and make a difference. I didn’t end up realizing that dream until I was in my 30s, and by then I wanted to help make sure no one else would have to wait so long. Sally: I really like the structure: profile of a change-maker; a "how you can do it"; and your reflections. Can you talk about the process of writing the book and how you came to this structure? 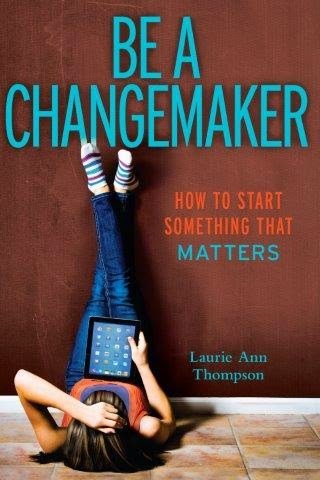 Laurie: I knew all along that I wanted each chapter to have a profile of a young person or team who was already doing it, followed by hands-on how-to sections so readers could emulate the changemakers profiled, but the “In My Experience” sidebars grew organically during the revision process. There were a few chapters where I kept slipping into a first person point-of-view. I was trying hard to fix and/or remove them, but I was having a hard time saying what I wanted to say in the way I wanted it said. My editor liked those sections and suggested pulling them out and making them sidebars. Once we did that, we decided to make it consistent by doing one for every chapter. I’m a shy, private person, so those sidebars were the hardest parts of the book for me to write! In the end, though, I’m glad we did them. I wanted the book to feel like an honest conversation, and I think those personal experiences add a touch of vulnerability and authenticity that helps keep it real and engaging. Sally: So, are you a "change-maker?" Laurie: I never would have thought that I would be, and despite having important roles at big companies, co-founding a technology startup, volunteering countless hours at many organizations, and a commitment to philanthropy, I never used to feel like one. Now, I do. Being the co-regional advisor for the Society of Children’s Book Writers & Illustrators of Western Washington for three years was my first taste of really being a changemaker. I had the good fortune of inheriting a strong, healthy organization, so I didn’t have to build anything from the ground up, but we did make a lot of small changes and put our marks on it, and I know it made a difference in the lives of writers and illustrators in our region and also in the lives of the children (and adults) who will get to enjoy their great work. And, of course, I hope that putting this book out into the world will have a wide-reaching ripple effect of positive change around the world, both through the projects readers launch now and in the changes in their later lives as a result of that early empowerment. Sally: Question three-and-a-half ~ What’s your next book? Laurie: My first nonfiction picture book, Emmanuel’s Dream, comes out in January of 2015. It’s a biography of Emmanuel Ofosu Yeboah, who was born in Ghana with one leg. In his early twenties, he rode a bicycle nearly 400 miles to change the way disabilities in his country were perceived. Sally: Wow! He sounds like a changemaker! You can learn more about Laurie at her blog, LaurieThompson.com. Book Giveaway Rules: All you need to do is leave a comment. Then email me so that if you win I can contact you. send email to sueheaven (at) gmail (dot) com. Book giveaway is open only to US residents. Whew! I hope I got everyone on the list. Have fun! Review ARC provided by Blue Slip Media. This is a book you can fall in love with just by the cover. Really- who can resist frogs lazing about on lily pads? it's fog, frost, and sea. 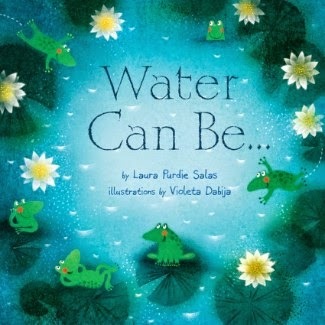 At the back she includes notes that explain a bit more about the things water can be, as well as a glossary and some suggested reading for curious kids who want to know more. In my garden water can be: a magnifying lens (drop of water hanging from a leaf-tip); bee drinking fountain (water collecting in depressions), mushroom sprouters, soil soakers, seed-feeders. What can water be in your neighborhood? Drop by STEM Friday to see what other science books and resources bloggers are sharing. Review copy provided by publisher. Welcome back from Summer Vacation. Yes - it's Labor Day. A day to celebrate the work people do. 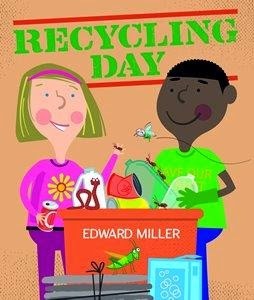 Here's a book about the kind of work anyone - even kids - can do to make their world a better place. A girl came by and posted a sign: "Recycling Day. This Saturday help us clean up this lot!" Kids showed up with rakes and bins and work gloves. They tossed glass in one container, cardboard in another, sorted cans and plastic, and started a composting bin. Then they planted seeds. The story is accompanied by text boxes filled with facts and statistics about trash and how it can be taken out of the waste stream and recycled into new products. Backmatter lists more recyclables: toys, electronics, batteries, fabrics ... and includes information about reducing the amount of garbage that goes to dumps. Don't let the talking worms and eye-patch-wearing rat fool you: this book is crammed with facts. And the issue of trash attracting rodents is so serious that New York City has created a "Rodent Academy" to teach people how to "rat-proof" their homes and businesses. NPR recently ran a story on the "Rat Academy" - you can read and listen to it here.